Teenage vaping has been called an epidemic. Now, a Green Bay lawmaker wants the city to ban the sale and possession of electronic cigarettes for all minors. At businesses like Vapin USA in Green Bay, a minor would have a hard time buying electronic cigarettes. Their policy here is to card everyone who looks under 35. But one Green Bay lawmaker would like to make the cities law clearer for all retailers on who can purchase vape pens. Currently, the state statute says it's illegal for retailers to sell e-cigarettes with nicotine to anyone under the age of 18, but these products can also be sold without nicotine and that is a concern for some Green Bay city leaders. GREEN BAY, Wis. — Teenage vaping has been called an epidemic. Now, a Green Bay lawmaker wants the city to ban the sale and possession of electronic cigarettes for all minors. At businesses like Vapin USA in Green Bay, a minor would have a hard time buying electronic cigarettes. Their policy is to card everyone who looks under 35. But one Green Bay lawmaker would like to make the city's law clearer for all retailers on who can purchase vape pens. 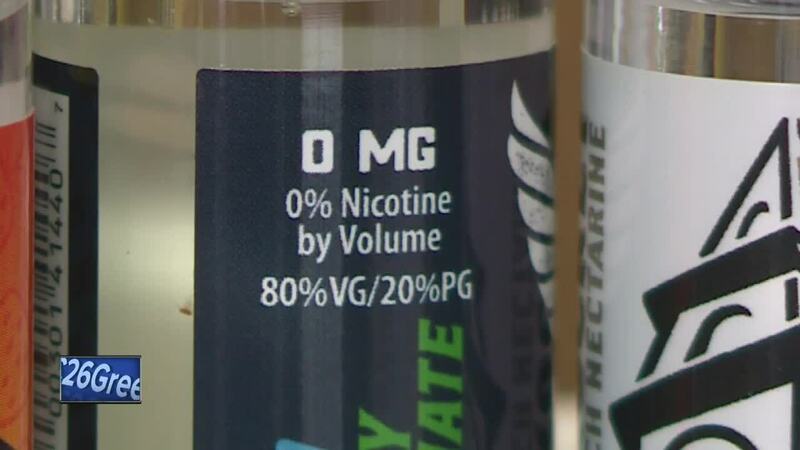 Currently, the state statute says it's illegal for retailers to sell e-cigarettes with nicotine to anyone under the age of 18, but these products can also be sold without nicotine and that is a concern for some Green Bay city leaders. "Technically vaping with nicotine would be illegal, but how would you tell, how would you know because there are vaping products without it,” says Randy Scannell, the Green Bay Alderman for District 7. “So, it is a grey area that needs to be addressed." "It's good to have on there because you never know what other stores might do,” says Vapin USA’s Allison Vandeveld. “And they might think, 'Well, there is no nicotine in here we can still sell it' and none of us agree with that. We want those products out of the hands of any minor." Alderman Scannell says he's like to see an e-cig ordinance drafted as soon as possible so that the city could vote on the matter in early March.